(Newser) – A mother shark can be away from her birthplace for years—but she'll still return there when it's time for her to have babies, scientists have found in a 17-year-study. Researchers suspected as much, but to confirm their suspicions, they decided to follow individual lemon sharks starting in 1995; that's when they tagged babies and "toddlers" with transponders and took tissue samples. For each of the next 17 years, researchers headed back to the site, tagging newly-born creatures. Their findings were released just this week, the Los Angeles Times reports. Hmmm . . . how does this theory play out for sharks that were birthed in a sharknado? 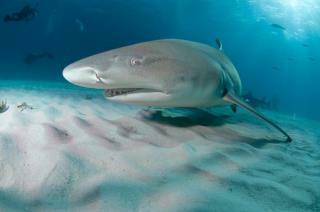 my theory, it is possible the lemon shark might only be the one or a couple of variety of sharks that return.. I remember decades back when researchers said that sharks need to continually move to breath / live to have water flow through their gills.. then when doing some deep sea research they came across sharks not moving, sleeping on the bottom of the sea, with no currents, they had to rewrite the books. Makes sense. Maybe the female figures that if she survived at that spot then it's a safer place for her brood.